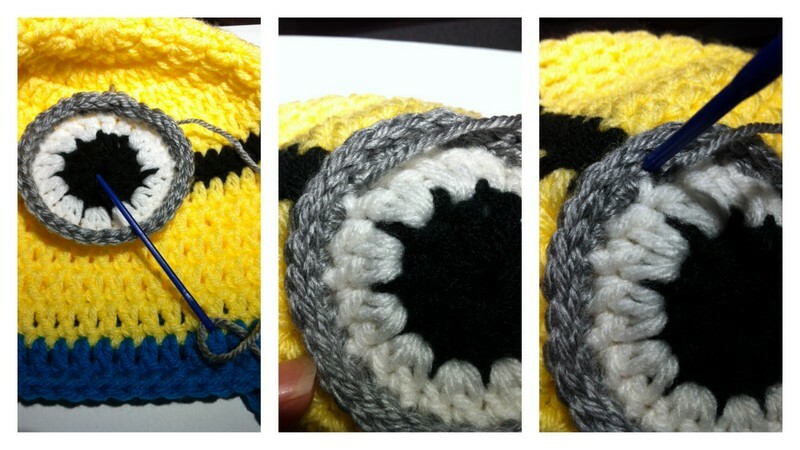 After an unexpected positive response to my crochet minion kids hat, I was asked about providing a pattern. I thought about trying to draft up a fancy PDF file and post it for sale, but I am no crochet expert and besides, writing a formal pattern would take me f-o-r-e-v-e-r. 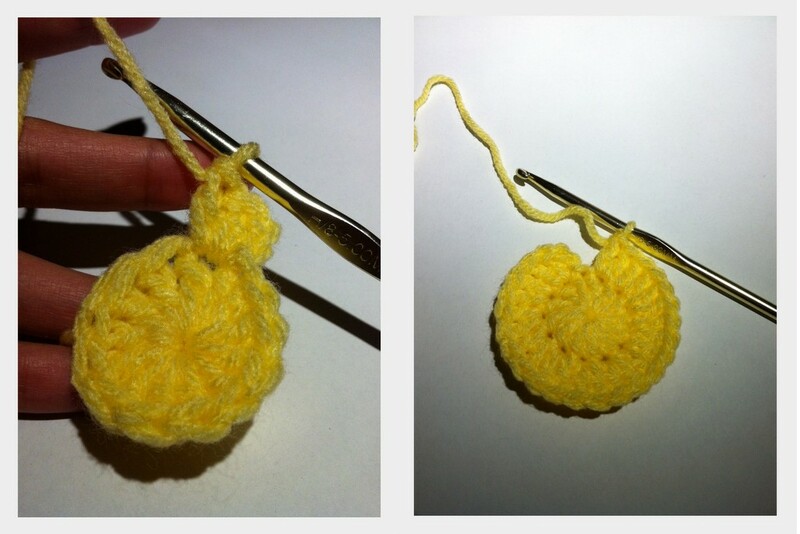 I would be happier giving crocheters out there a fun tutorial to make their own minion characters. Anyone else who would like to purchase the finished item can do so thru our Etsy shop where it is listed in various children’s sizes. The following detailed tutorial is for a child 3-5 years old for a 20 inch head circumference. An abbreviated pattern for others sizes will be towards the bottom of this post. I apologize for the poor quality of the photos, as I was very eager to get this post out to those who requested. My vampire schedule makes it difficult to take good photos without the natural daylight. Especially when I’m stuck indoors most of the time. 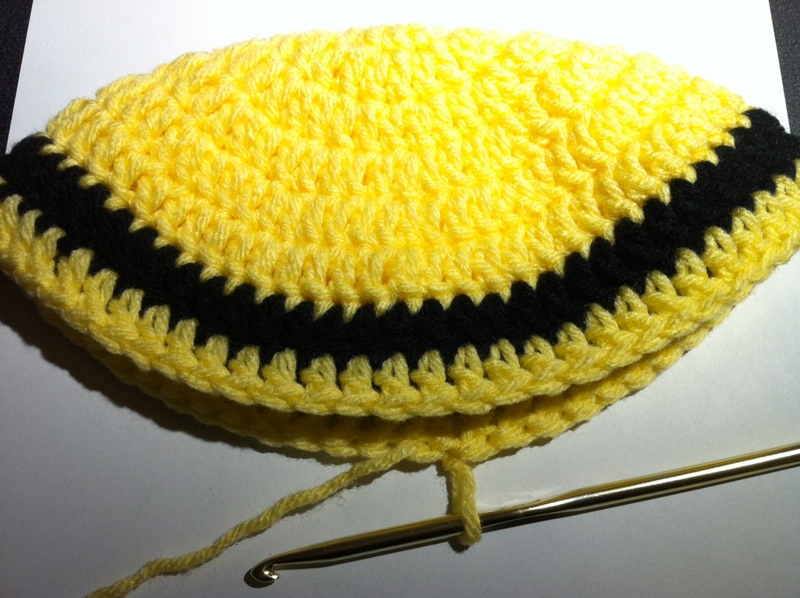 The base of the hat starts with a magic circle. For those not familiar, there are oodles of magic circle tutorials and instructional videos available online. Try this link here for an easy to follow tutorial. R1: starting the yellow color, create a magic circle. 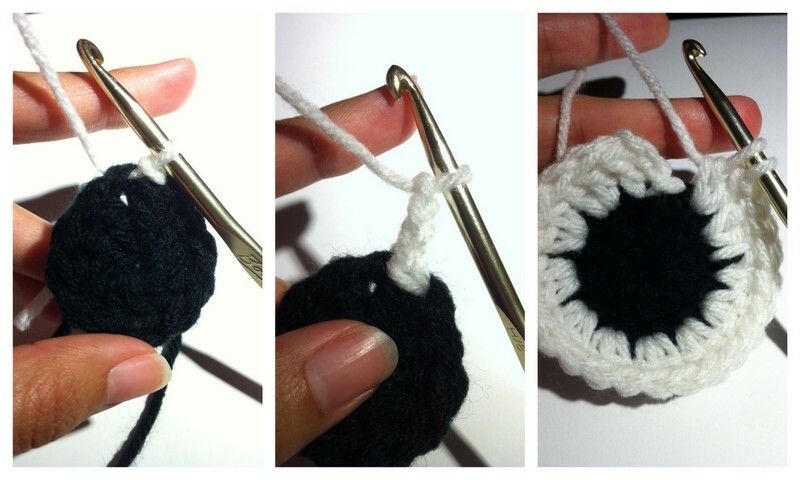 12 DC (double crochet) into the magic circle, and close up the circle by pulling on the short strand of yarn. 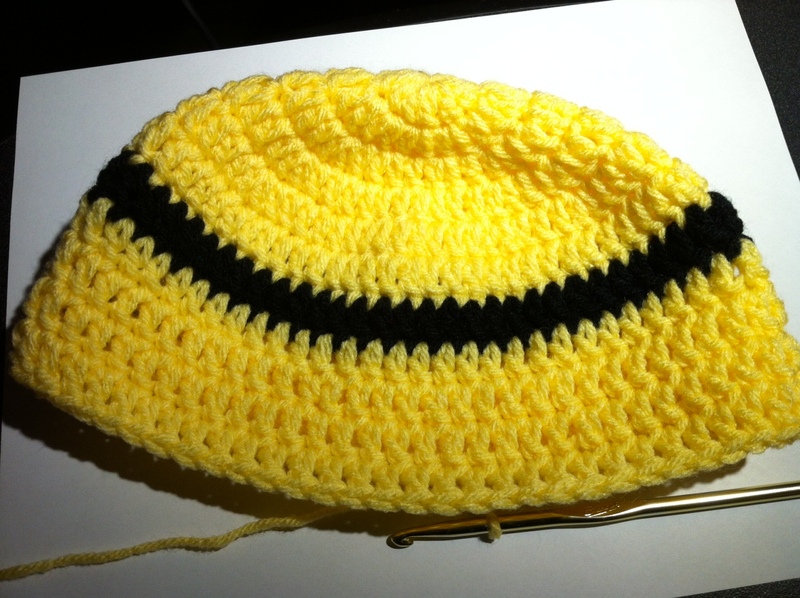 Row 1 for the 2nd earflap will be stitched AWAY from the seam, maintaining the 14 stitches in between the 2 earflaps. 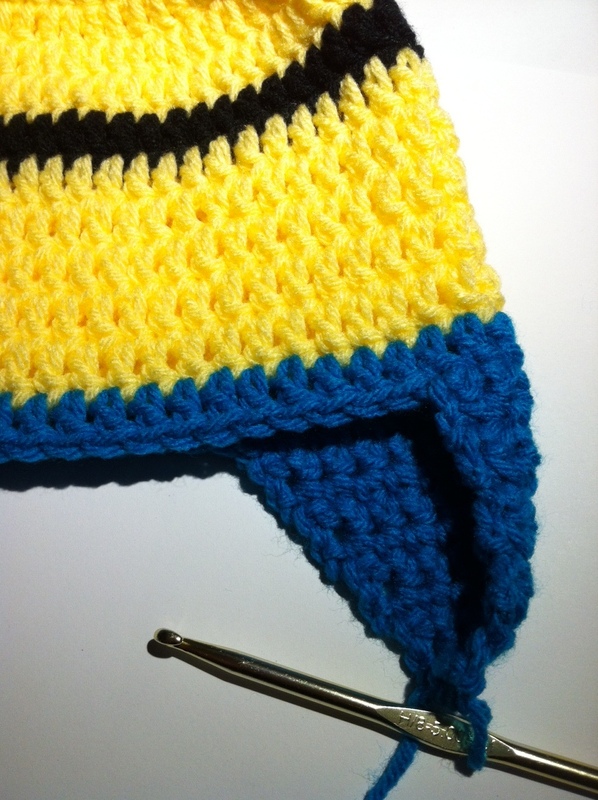 Once back at the beginning of the where the edging started, SC 3 into the center space created in the earflap. (notice the small *hole* visible in the first picture) This creates a rounded edge and allows an opening for braided tails to be attached if desired. 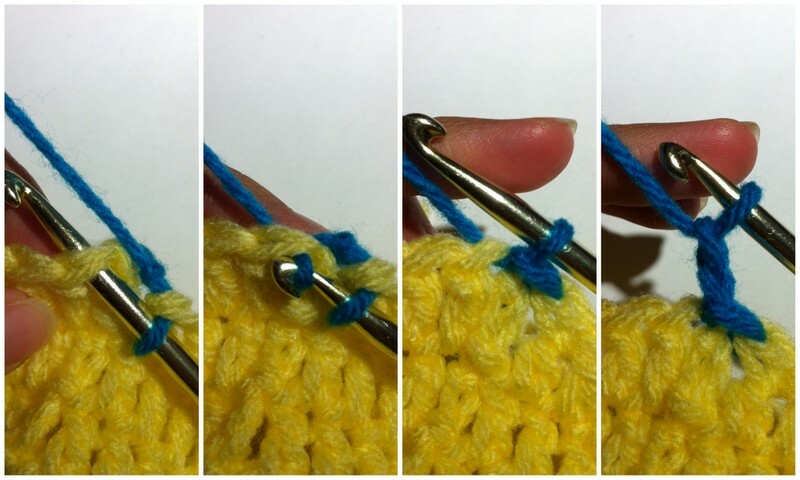 Slip stitch into the chain #3 from the beginning of the row. Only partially complete the last DC (#24). We will be adding a 3rd yarn color, using same method. 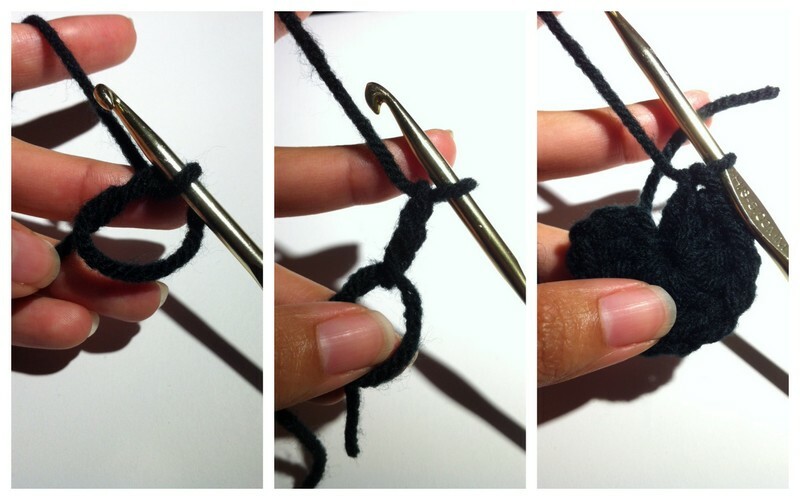 Attach the gray yarn to the hook with a slip knot and pull thru the 2 white loops on the hook, completing the 24th DC of the round. Folding the group of strands in half, pull the center of the strands thru the location on the hat. All that is left to add is the smile. Which can be added with black yarn and a large needle. Placed wherever desired below the eye. 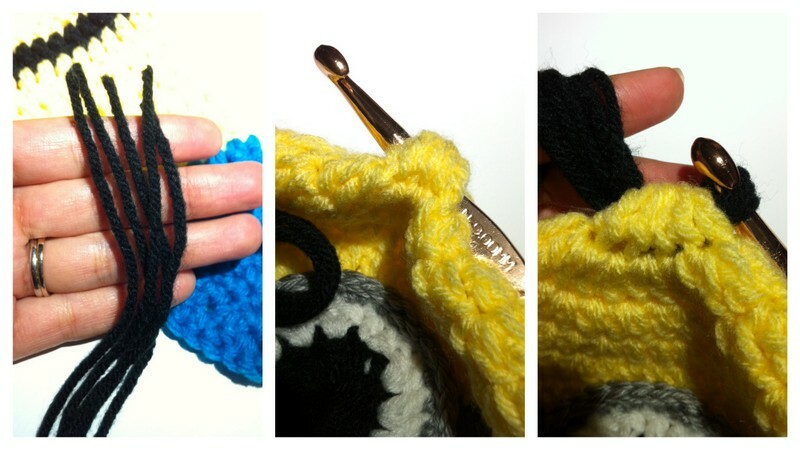 Choose a frowny face, sideways smirk, or smile and hand stitch it into the yellow DC. 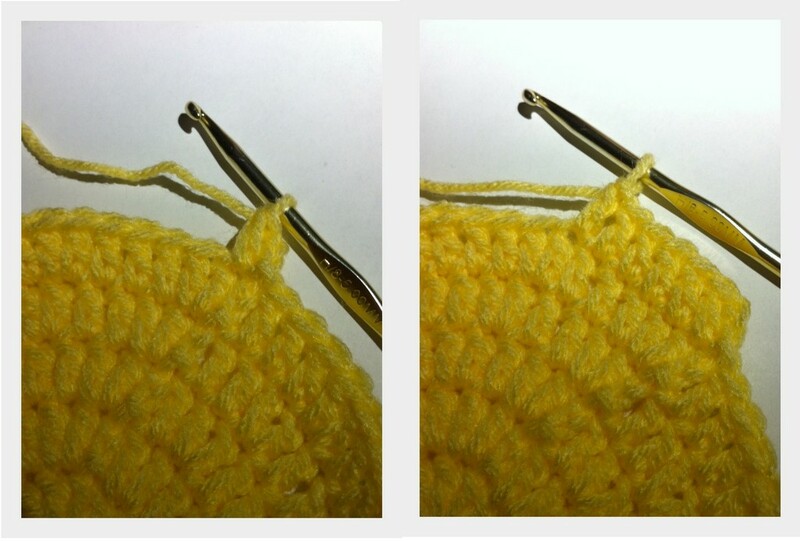 Crochet away from the seam where the other ear flap is, keeping 14 stitch distance in between the 2 earflaps. 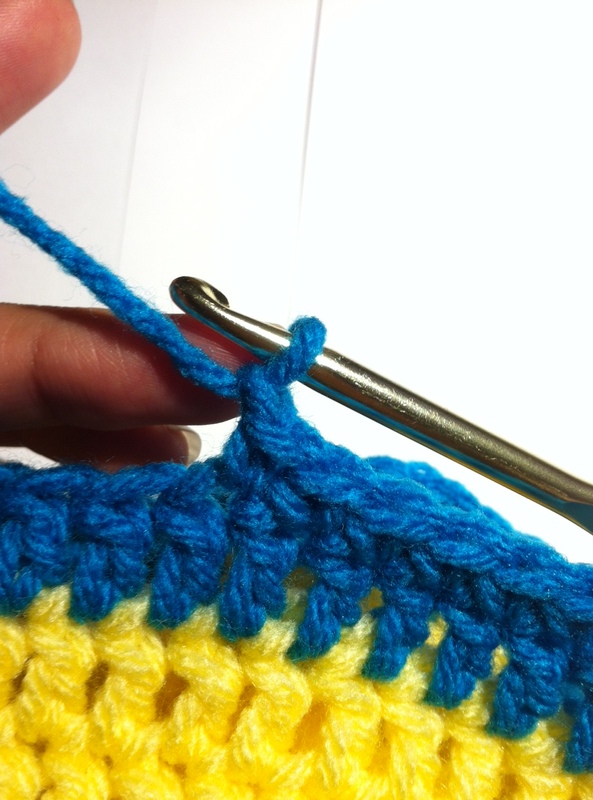 Crochet away from the seam where the other ear flap is, keeping 16 stitch distance in between the 2 earflaps. 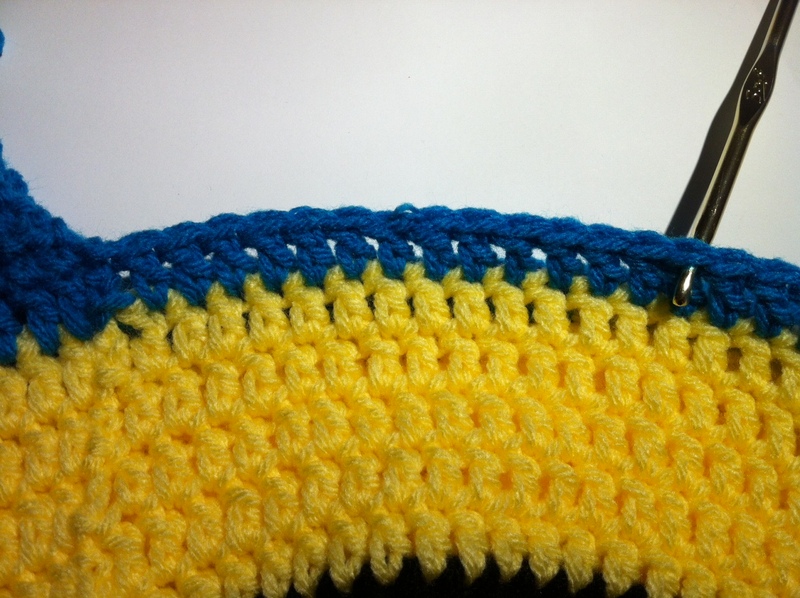 Pattern can be modified to smaller baby sizes if desired. Simply do not increase to the larger sizes and take away rows. I hope this tutorial is helpful to anyone wanting to tackle making their own child sized minion hat. 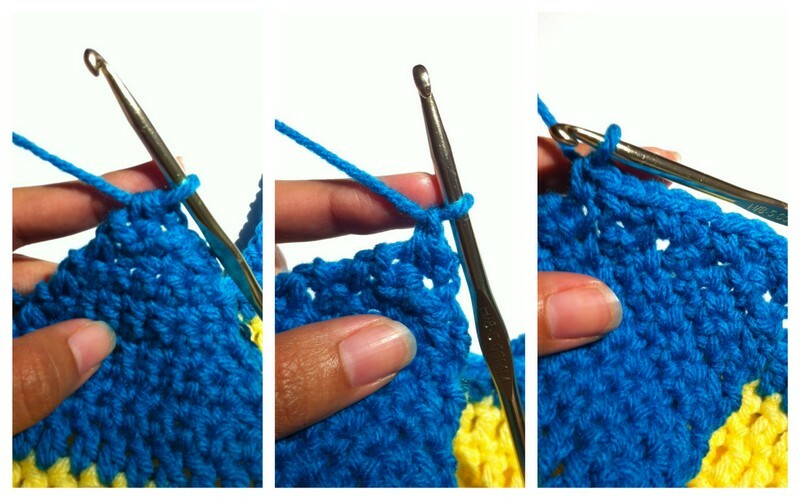 Be kind to crafty bloggers providing free patterns, don’t take credit away from them. Are the sizes you have listed the hat size or the head size? The sizes listed are for the head circumference. Thank you so much for this tutorial! It was easy to follow and I appreciate the pictures! We are minion crazy in our house right now so I am currently making these for the kids. Thank you SO MUCH!! Thanx so much for d pattern. 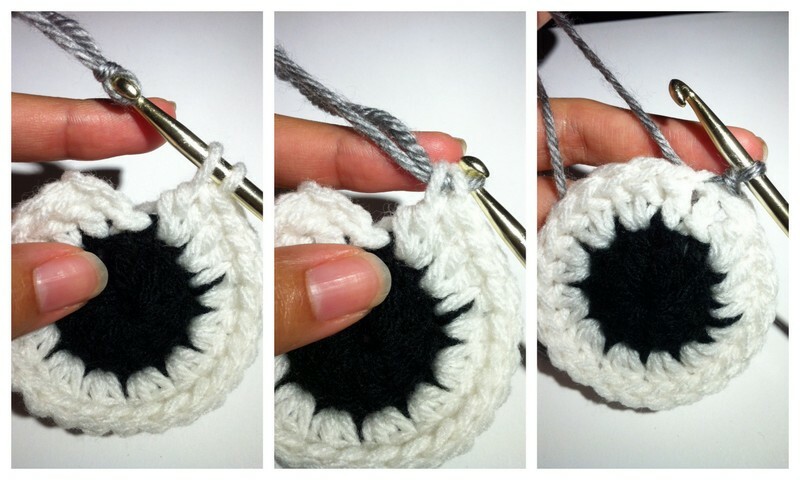 I learnt a new way to join different color yarn. The hat turned out perfect and now my husband wants me to make one for him. Thanks for the very clear tutorial. I plan to make some of these for a charity event in December and I will be sure to give you credit for all the work you did in creating all these patterns! My minion hat is off to you! So sweet of you!! Thank you! In the child size hat for round 7 it says ” attach black yarn, *2 DC, 12 DC*, repeat around **” Is the 12DC a typo? Thanks, love the hat! It is not a typo 🙂 its is to add a small increase in the round. It ends up finishing the round with less than 12DC, about 7 or 8 I think. I even wen bak and counted the previous round to make sure I had 60 stitches. A little confusing! How would I increase for an adult sized hat? Also I’m confused with your 3-5 and 6-10 yr instructions. It seems they have the same instructions to increase to 60 for both of them. The increase to 60 makes a hat for 6-10 yrs. Sorry if it seemed confusing, the larger size instructions include a step to increase the next row following the 60 dc. The increase is described as every other 12 stitches. This adds a slight increase giving the hat approximately 1 more inch in circumference. trying to make for adult & don’t understand the increase after the 60 can you please be more specific on what do after row 5 to make this bigger? Thanks so much! Thank you for this! I made 2 for my kids and now I am making some for friends. I will be sure to tell them where I found the pattern!!! Thank you so much! I’m glad the pattern is working cus I am no expert. Thanks very much, they are so cute! Thank you so much for taking the time to write this tutorial! 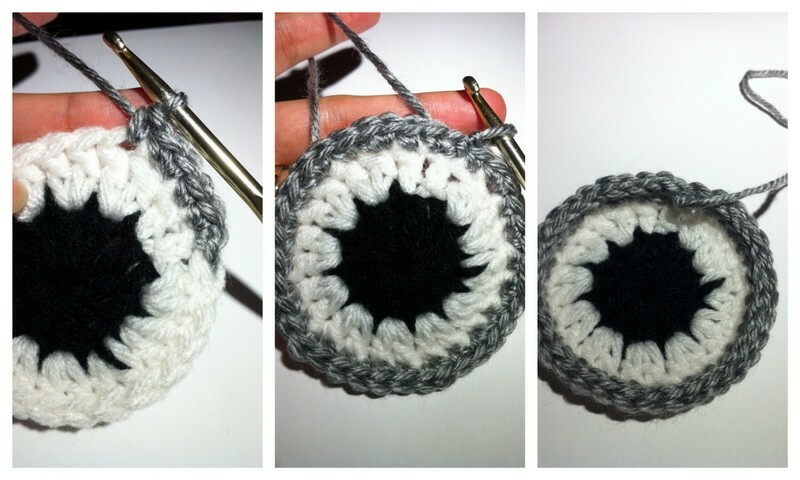 I love to crochet, but have never been able to work in a round without hating how it looked. I could never get the hang of it….until I found this!! I am making these hats for my niece and nephews and can’t wait to send them! Thank you again! I’m soo glad you liked it!! Thanks for the kind words. Thanks for the the the instructions and tuorial. They are,cute! And vy easy to follow. Thank you so much for writing out this pattern! I have been looking for a DC hat pattern. I have made 3 hats already. 🙂 I was asked to make one for an adult. In the comments below you said I could add an increase round after Round 5. Would I do 1 or 2 increase rounds for an adult? Round 6 as an increase round would be a total of 72 DC in that round? Thanks again for taking the time to write out the pattern and sharing it with everyone. That great!!! You’re very welcome! 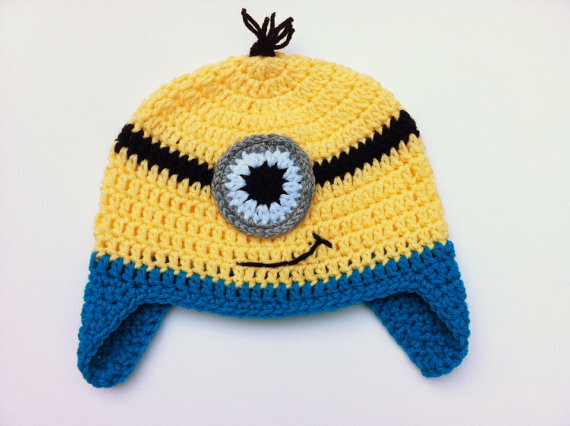 This is the cutest minion hat I’ve seen out there, great work!! 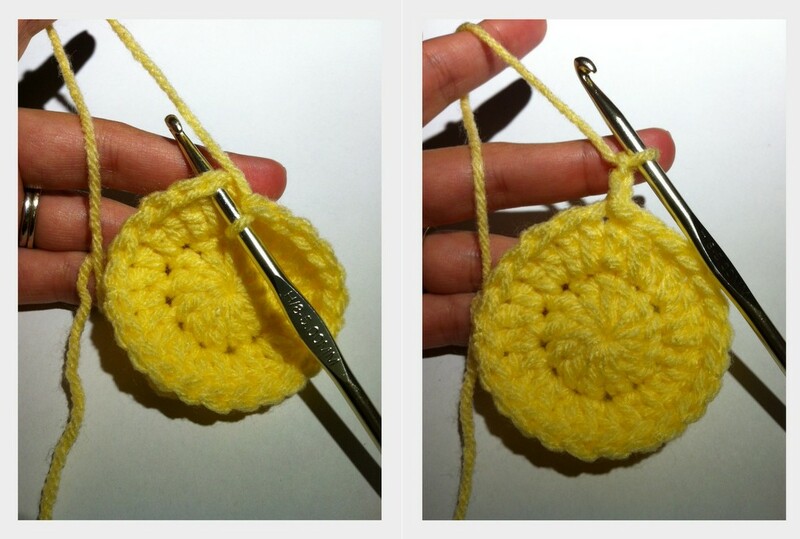 I’m fairly new to crochet and would love to try this pattern for my son, but I’ve never even heard of a “magic circle”. Do you by chance have instructions? Thanks! YouTube also has some great instructional videos! Thats how I learned how to do the magic circle. Hello! Thank you for providing these awesome patterns! Do you have a pattern for an adult size as well? Thank you again..! Hi! 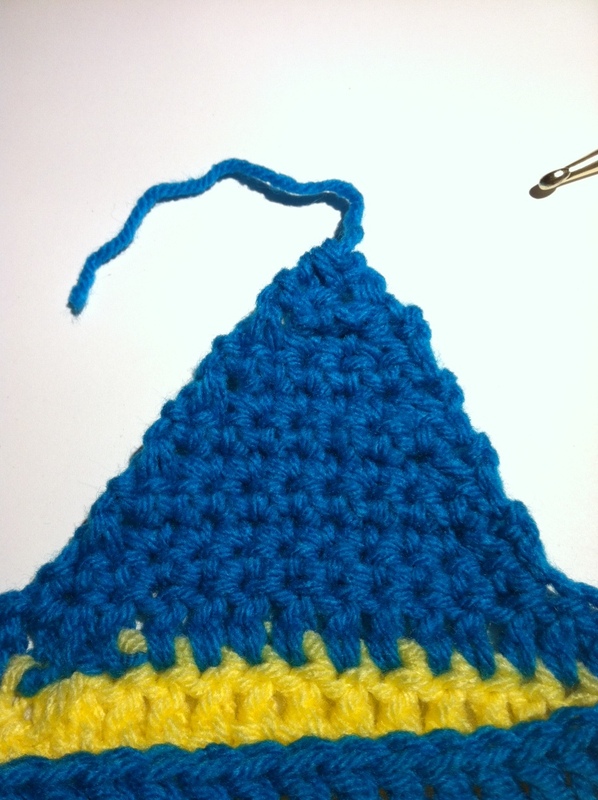 If you would like to make an adult size of this hat, just add another increase row to make the hat larger in circumference and a little longer as well. Where pattern reads “R7: attach black yarn, *2 DC, 12 DC*, repeat around **”, replace that step with “R7: attach black yarn, **2 DC in same stitch, 1 DC into each of the next 4 stitches** (looks like 2,1,1,1,1), and repeat around. Also add another row once the increase is complete to add some length to the hat. Hope that helps! Thank you so much for the pattern! I am a beginner. When I add another row after 2,1,1,1,1, do I do the same or do I just do 1 DC all around? I’m happy you are trying the pattern! Sorry if it’s not very clear, the row following the last increase does switch to 1 DC in each stitch around evenly for every row after. Hope that answers your question! Hi there! I would love to help with any questions. What is an email I can write to in order to contact you? Hi, I too love the pattern. Made one and need it bigger. The questions above are exactly what I needed to know. Thank you. I’m glad I came back to the web site and found this information. Now to get busy making another one. Grandson comes in morning and will expect to have his done. The first one was to little but he wouldn’t let go of it . He said he would give it to a friend that has a little head at pre school. Funny huh. ( its the thought that counts) right. Absolutely! Mona.silva@gmail.com. Hope I can help! Just finished one of these for my little guy…he’s going to be a minion for Halloween 😀 This is perfect; thanks so much for sharing! Please help! I love this pattern, but am stumped at Row 7 where it says 2DC,12DC. Does that mean I’m supposed to 2 DC in each stitch, but do not know what 12 DC means next? I’m sorry for the confusion. Perhaps I should me more clear. 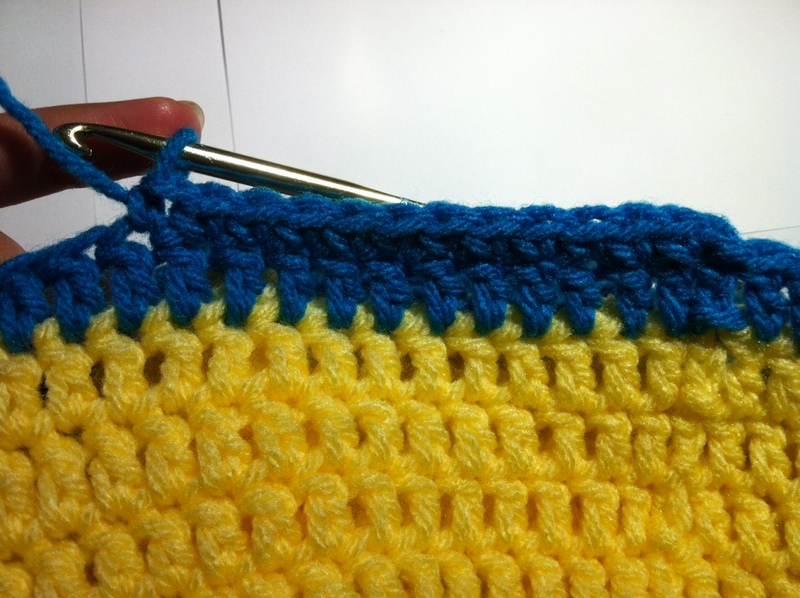 The first says 2 double crochet into the first stitch, and then 1 double crochet into next 12 stitches. After the 12th stitch, repeat the process. This creates enough of an increase in that row to make the six suitable for that age. Hope that helps! Got it! Thanks! 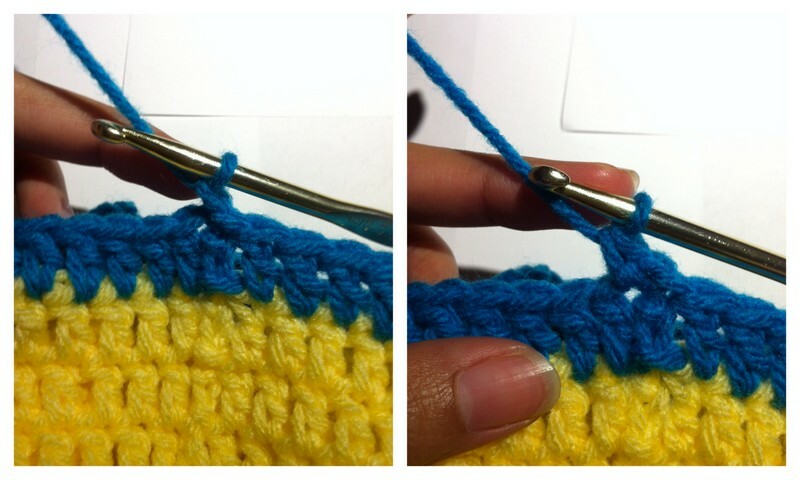 I was reading as if to DC12x in one stitch, then figured it must be DC into next 12 stitches. Great pattern, thanks for sharing! used a wool blend yarn which was very soft. Could this be the prob? Would love to try it again. Hi! I’m glad you’ve tried the pattern but sad you’re having problems!! I wonder if you’re interpretation of the increases is causing the hat to end up that way? I did my best to explain it but I’m no expert. 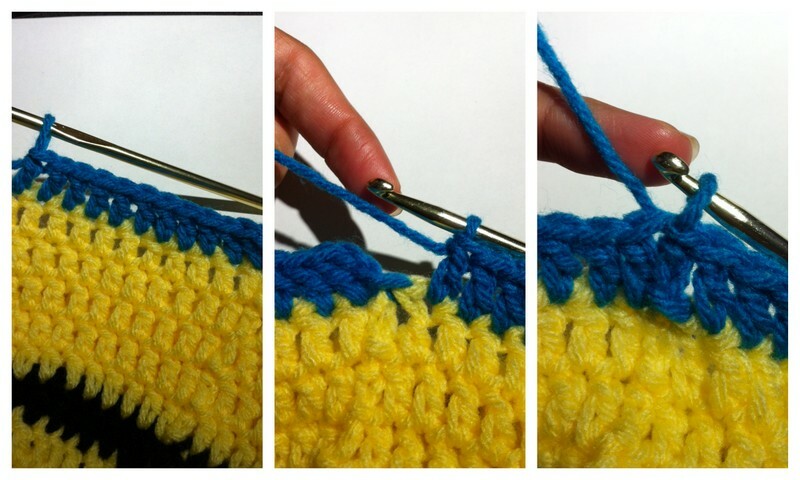 Make sure to count the number of stitches at the end of every row to make sure you are not adding too many. 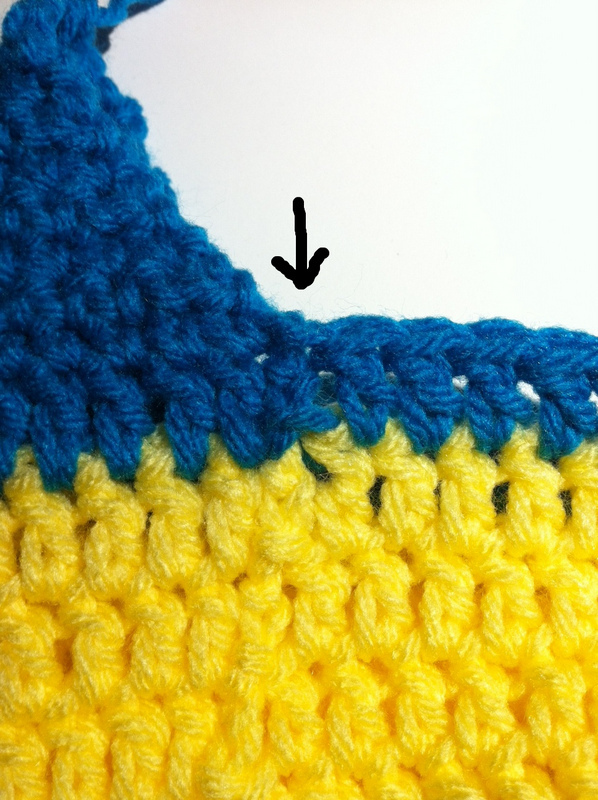 The last increase for the larger size should only add a few from the total on previous row. No I haven’t had any problems with this pattern. 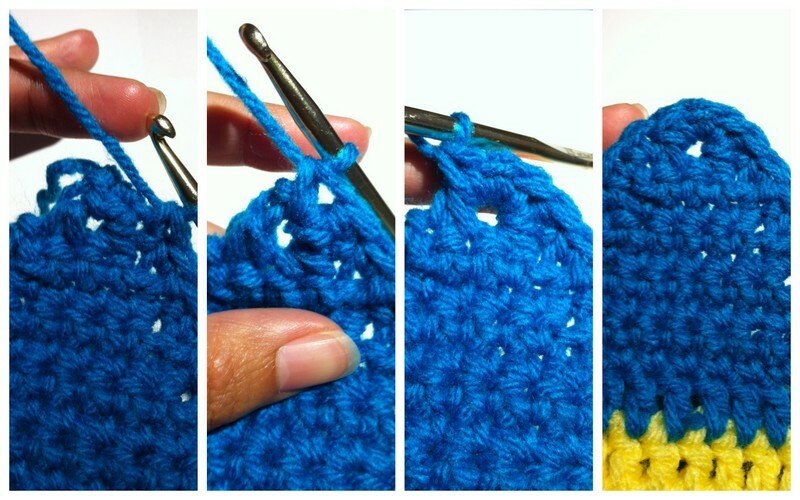 Its very easy and I’ve already made 3 for ages 8,10 and 23yr old using the 6-10 yr pattern. Takes me less than 3 hrs each. Thank you for this pattern! I have made about 8 in the past week! So much fun!! Just finish three hats Ty! I did very well thanks to u! I love your minion hat pattern. I made 2 and came back to make 2 more but I can’t read the pattern anymore since you changed your wallpaper. Please help! That so nice of you to say!! Thanks!! Thank you so much for this! 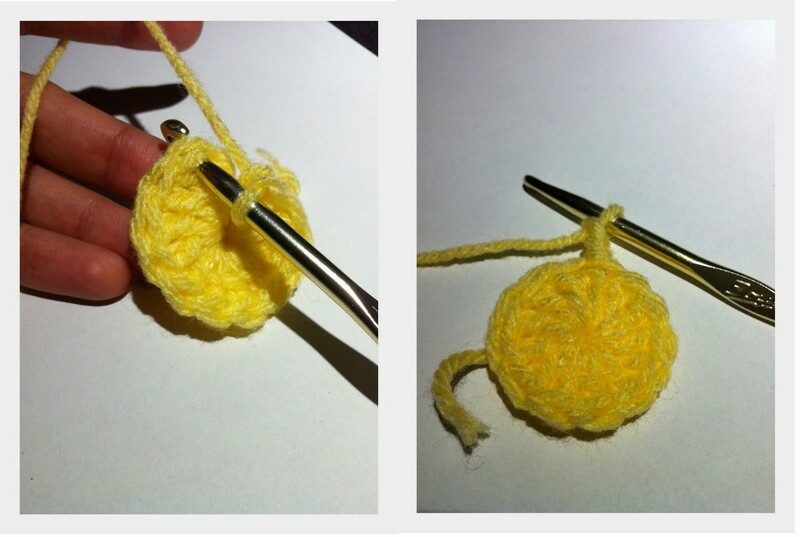 I am a beginner to crocheting, and this was very easy to follow and understand. I made it in a day! Both my nephews will get one for Christmas, and if I have time I’ll for sure be making more for some friends! Thanks!!!! =) thank you so much for that! Hello I managed to make the child size one perfect and love the pattern was very helpful!! Am trying to do the 6-10 one but at the moment am on r6 and it is flat and round and looks too big so am confused??? Any help appreciated. I’m glad you are tryin the pattern! The hat will look abnormally big but I promise it’s ok. Keep in mind most that she have a 20+ inch head so it will look big but it will fit 🙂 keep going, do a few more rows and if it still doesn’t look right then we can troubleshoot together. Thank you I shall keep going and hopefully it will start looking more like a hat but at the moment it isn’t even going up like a hat it’s just flat. Did the hat turn out for you? It could be the last increase giving you trouble. Hi!! I love this pattern! It is so easy to understand. However I seem to be having the problem as Vanessa. I am on row 10 and its starting to take shape but for some reason the top of the hat is flat. I have restarted several times and it still looks like Frankensteins head. Lol! Any thoughts on what I might be doing wrong? If you don’t mind could you please email me at kkerr714@yahoo.com. I would like to be able to send you a pic of what my hats are looking like to give you a better idea. Thanks!!! Great tutorial!! Thanks a lot for sharing it with us. Best tutorial I have ever used. I made this very quickly..
Hi! I’m glad you’re trying the hat. It sounds like your increases aren’t going along as they should in those first few rows. 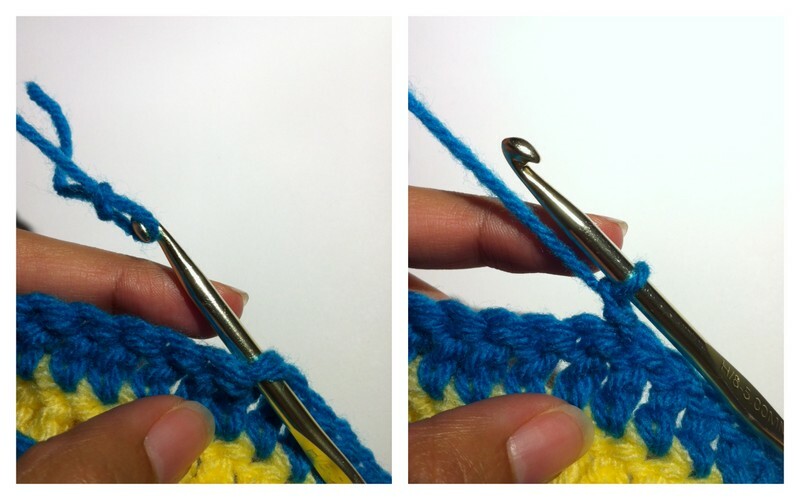 Make sure you count your stitches at the end of the row to ensure you didn’t leave any stitches out. The circle should lay flat until you get to the rows with no increases left. Hope that helps! If not, feel free to come right back. Mayb I can send a pic too as for some reason I’ve done something wrong and the hat is huge. I love this pattern and it was so easy. It’s been years since I crocheted anything, but I had to try this one. Now my granddaughters have hats to match the tees I made them with a minion appliqued on the front! I posted pictures of the hats on my FB page, but I didn’t have your website handy. I remedied that–now it’s posted there! Thanks so much! Thank you so much !!! So very sweet of you. OK. so here I am, an avid crafter, but very new to crochet ( started teaching myself 3 weeks ago) , my small person saw me browsing patterns and went nuts when she saw this one and MUST have one for school, so I’m off to buy some yellow wool this afternoon. I’ll keep you posted on how it goes ( and if it goes well I’ll make sure to link to this blog with any pictures!!). Wish me luck! 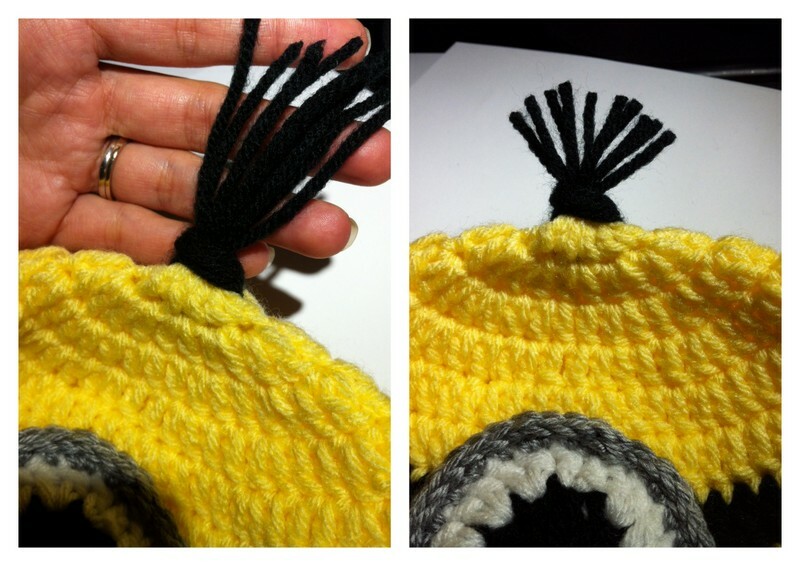 I just finished making my 6 minion hat for my grandkids. I haven’t crochet for over 30 years. Your instructions were easy to follow. Thank-you. And my grandkids are going to thank you also. After Christmas that is. Thank you for providing a free tutorial on this! You will definitely receive credit! I can admit I need to follow a pattern as I don’t like to try and make my own :). I’m making this for my granddaughter. I’m sure she will be thrilled! 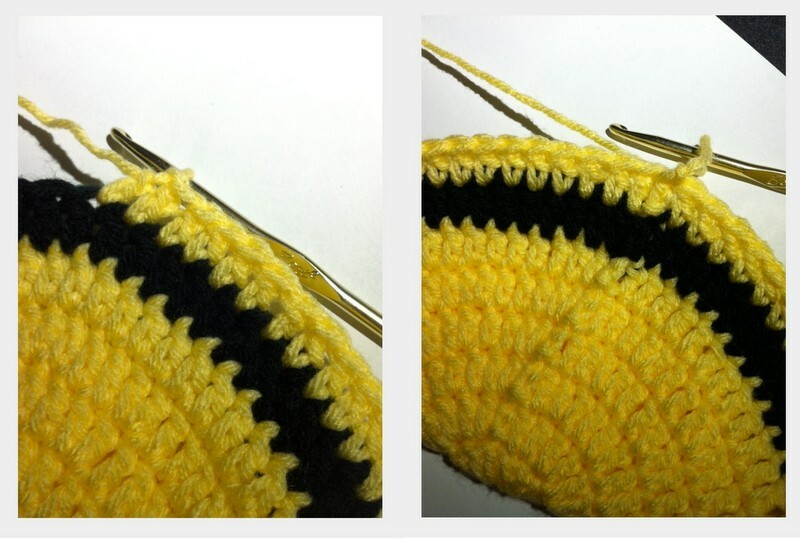 Here’s an easy tip for increasing, for a smaller baby sized hat, increase 3-4 rows until you get to a circle that measures about 5 inches across (the circle should be completely flat and measure from one end to the other). The amount of increase/rows will vary depending on the yarn you choose and your tension. So, good rule is if you can get the circle to measure 5 inches, and do not increase anymore after that, continue with 1 DC into every stitch around, that should give you a hat that will fit 6-12 month old. In the same vein, a circle measuring across 4.5 inches will give you 3-6 months. I hope that helps, its much easier than having to explain every row. =) Good luck! I’ve been searching the wild wild web, for a couple weeks to find an ear flap hat, I’m simply blown away by your incredible tutorial! Thank You Thank You! You Are A Rock Star! Thank you! Your instructions were great …. made my first hat! Hello. Thank you for doing this tutorial. I love the Ear Flap Minion Hat. My grandson wants the hat with braids or something like that. Can you please tell me how to add these on to the ear flaps? And again that you for supplying this hat pattern. I love this pattern but I followed your pattern for the 6-10 year old hat and I’ve done it twice. First with a 5mm hook and second with a 5.5mm hook. They both turned out the same size which fits my 6 month old daughter and obviously no where near the size my 7 year old could wear. I have no idea what I’m doing wrong! Help! I’m so sorry you’re having trouble! =( Which type of yarn are you using? If it is different (thinner) from the one I used it could be the cause of the size difference. Is your tension normally tight? If its not those things then we could trouble shoot this together. Feel free to leave your email and We can figure it out. Hope that helps! Thank you. 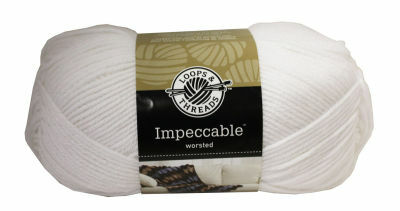 I am using size 4 worsted yarn. 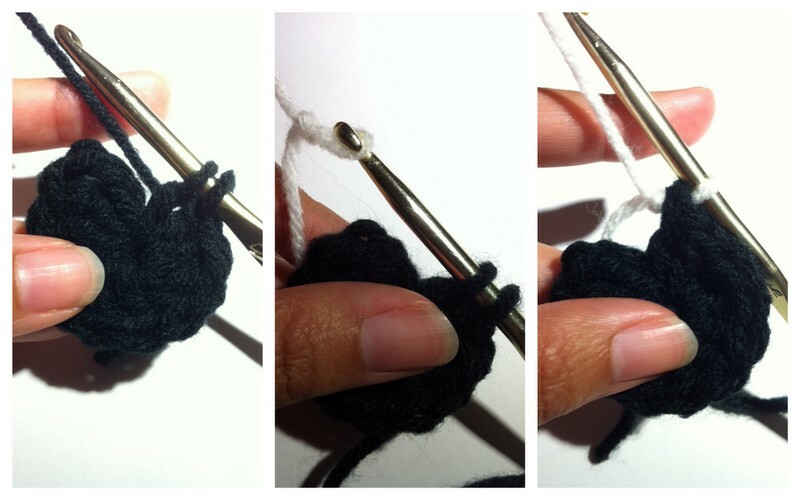 I may hold my yarn too tightly or just crochet tightly in general. I will try once more and try to loosen up a bit. Thank you. I will let you know how it goes. I just love you for this. Hi, I made this hat today and it is so stinking cute! I can’t wait for my son to find it tomorrow morning when he wakes up! 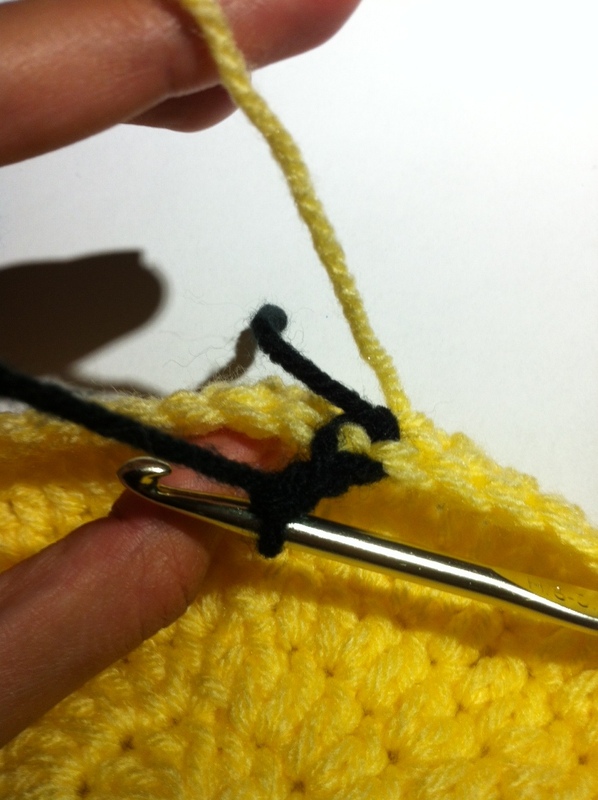 My only question is how to stitch the mouth without the yellow showing in between the stitches…I kinda made it work, but just wondering if there is a more obvious way to do it that I am not getting. Thanks so much for posting this tutorial!! Thank you !! 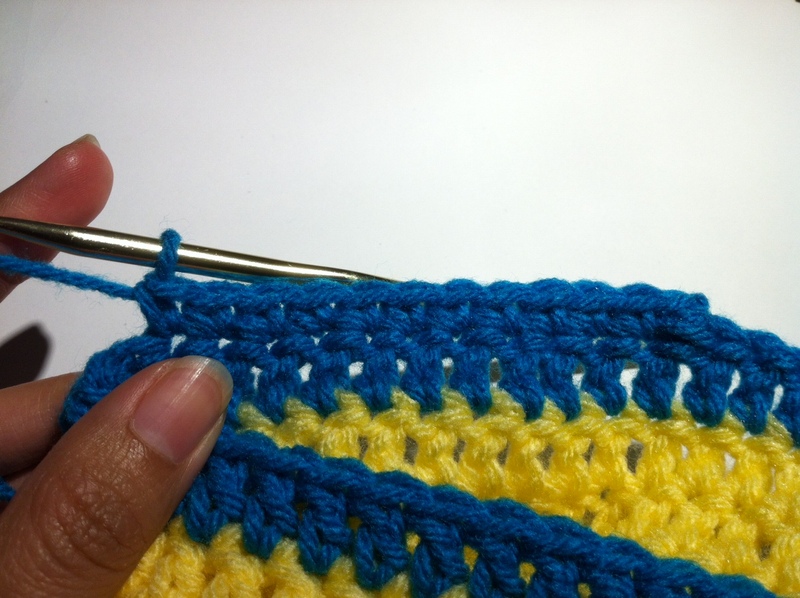 It is possible to slip stitch the mouth directly onto where you want it and it comes out beautifully. Hello I want to make some adult hats. I am on Rnd 6, could I just increase to (72 DC) And then on for Rnd 7 do 1 DC around. R8 add the black yarn, 1 DC around, then RND 9-13or 14 then for Rnd 15 add blue. I wasn’t sure if 14 Rnds would be big enough, but I am also not sure if 15 Rnds would be either. I don’t want the hat to look disporportioned. I have looked at a few Minion hat patterns and even though they are supposed to be sized for small adult to adult it wasn’t turning out big enough. Please help. Hi there!! I’m so glad you are trying out the pattern! I understand your concern for making sure the fit is just right. If it seems like the size isn’t going to be big enough at R15, go ahead and add another row of the blue with a R16. The pattern is very forgiving and a slight change like that should throw off the proportions too much. I really hope that helps, if not I am here! Thanks for the pattern. My niece and grandkids will love it. Thank you so much for great tutorial !! Very easy to understand , also great pictures !!! I made the hat for a 3 year old little boy that has cancer . thank you so much for a lovely pattern that was really easy to follow (I have only been doing crochet for a couple of months) My son loves his new hat, thank you again and please if you have any more lovely patterns that you would like to share, please do because your instructions are easy peasy for us newbies. Hi I think your work is brilliant. Thanks you for posting this pattern! So easy to follow, I’ve made 6 hats now ranging from infant to adult!! The adult size hat pattern is to small for the head . How can I make the hat bigger for a large adult head_? One of the best tutorials I’ve followed!! So easy to understand and follow step by step!! Thank you so much!!!! Thank you for sharing. I always have trouble placing the ear flaps. Your explanation is clear and thanks for the pics. Thank you for posting this! My two young grandsons will think I am the coolest Omi (grandma)! Thank you ! 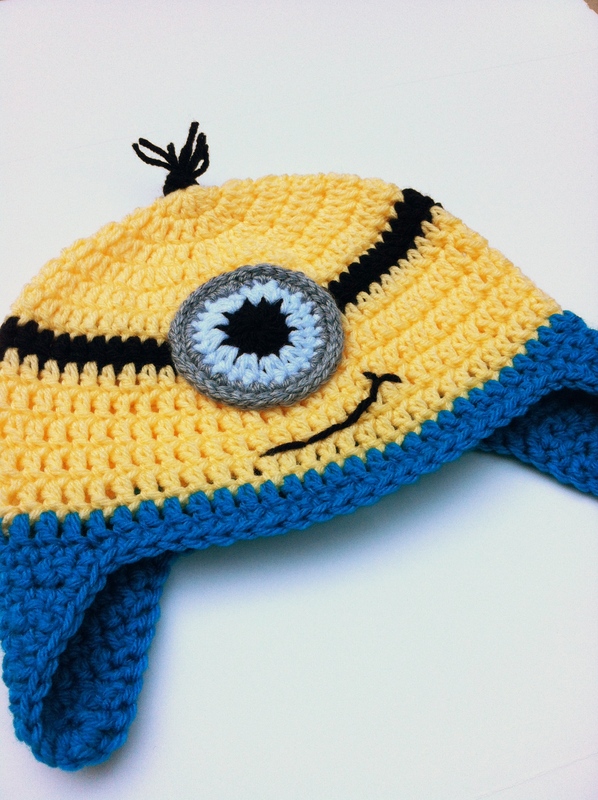 I’ve been searching for a free minion earflap hat pattern for my grandson! !